Japanese is probably my favourite type of cuisine, although I eat and like pretty much everything since I’m such a glutton. 😛 There’s just so many dishes that I crave for all the time like the tonkatsu I mentioned in yesterday’s post, and the various sushi posts I’ve had in the past, even udons, sukiyaki, yakitori…the list just goes on. Tonight I was craving for sushi train when Yuye and I walked past one in Box Hill, but the lack of customers turned us off (no patrons means not fresh fish). Japanese flavours are mostly very clean and light and very easy to eat. If you want to make Japanese food at home, you’ll probably survive by stocking light soy sauce, mirin (Japanese sweet rice wine), miso (fermented soy bean paste) and dashi (powdered bonito stock). These are all available from Asian grocery stores or major supermarkets. This is another fast and easy recipe we made for our (sad and unfinished) recipe app for the iPad. 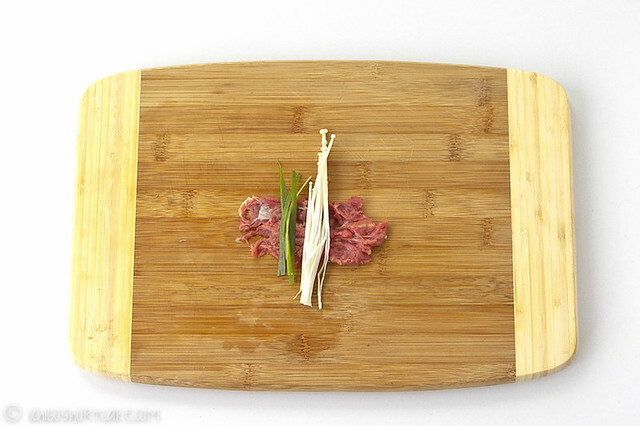 You can use pre-sliced hot pot beef (available in Asian supermarkets) which will save a lot of time or use higher grade beef fillets cut into thin slices to wrap the enoki mushrooms. But of course, the better the beef, the better the dish tastes! Just make sure you slightly freeze the meat before you slice it or else it won’t come out as evenly or thin. If you have a meat slicer then even better. Serve this dish as a side to a main, as a party canapé or make lots of it and have it with a bowl of rice, whatever takes your fancy. Lamb can also be used to substitute the beef if you so desire. 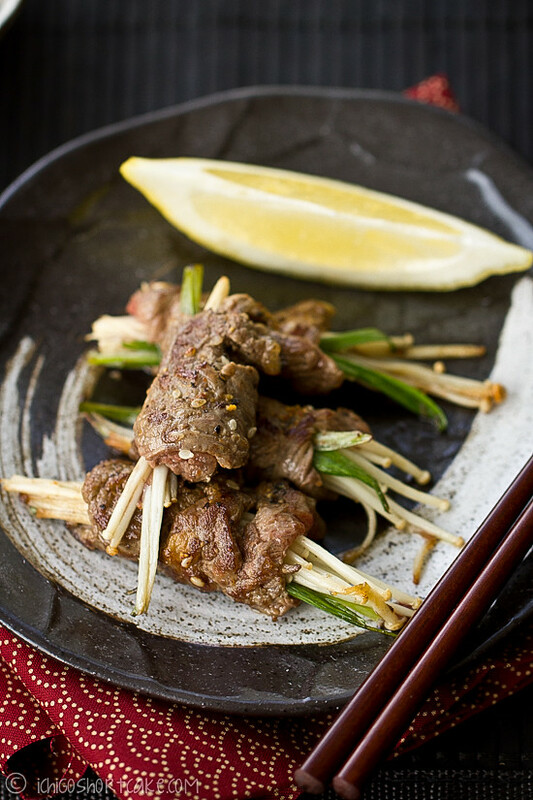 A Japanese appetiser featuring enoki mushrooms wrapped in tender beef and served with a citrus based sauce. • 150g beef scotch fillet, thinly sliced into 2mm thick slices. 1. Cut spring onions into 8cm lengths, then thinly slice them length wise. 2. Lay out 2-3 slices of beef with enoki mushroom and spring onion to one side as shown. 3. Carefully roll beef up, leaving the final seam facing downwards. 4. 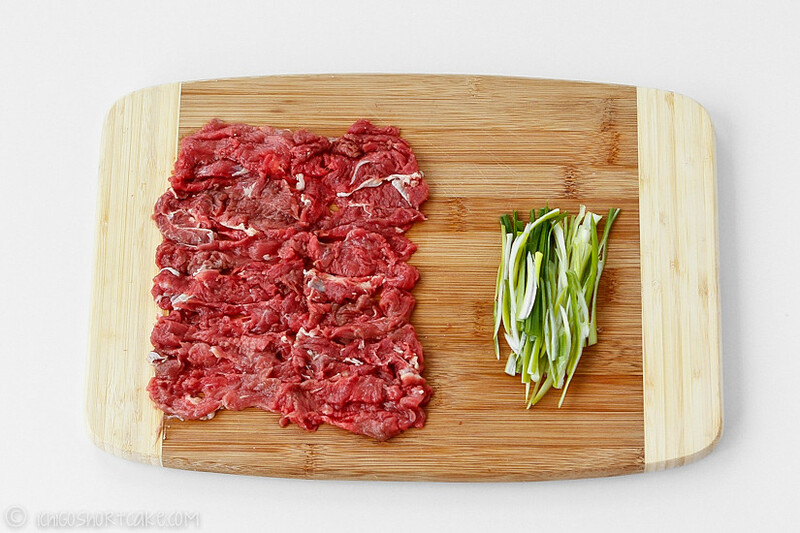 Repeat process with remaining beef, spring onion and enoki mushroom. 5. 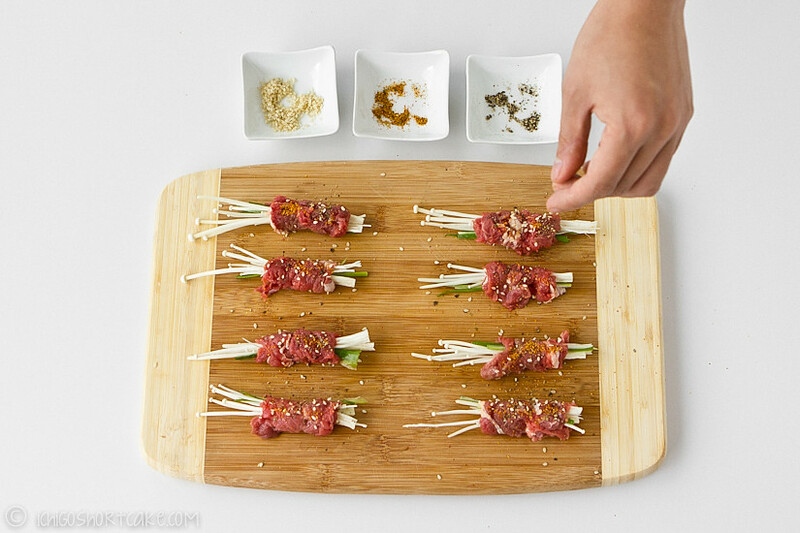 Season beef rolls with pepper, Shichimi*, sesame seeds and salt to taste. 7. 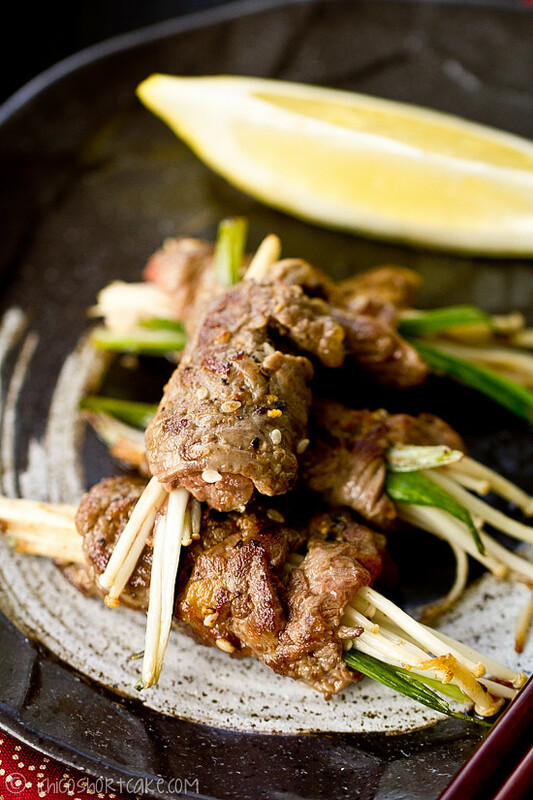 Serve with ponzu sauce*** and lemon for dipping. * Shichimi is a Japanese spice which contains 7 different ingredients such as black and white sesame seeds, ground red chilli pepper, ground Sichuan pepper, roasted orange peel, hemp seed, ground ginger and dried seaweed. Different brands may use different ingredients as substitutes. 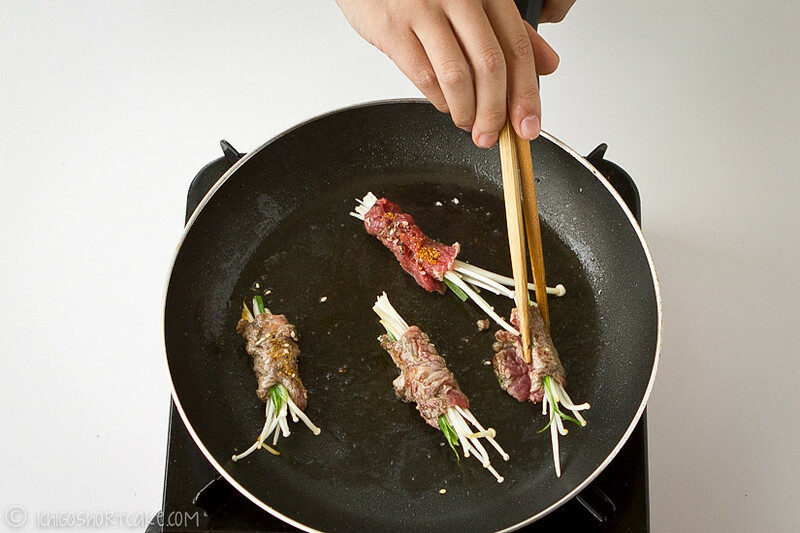 ** Place beef rolls seam side downwards initially when frying, as this prevents the rolls from unfolding. 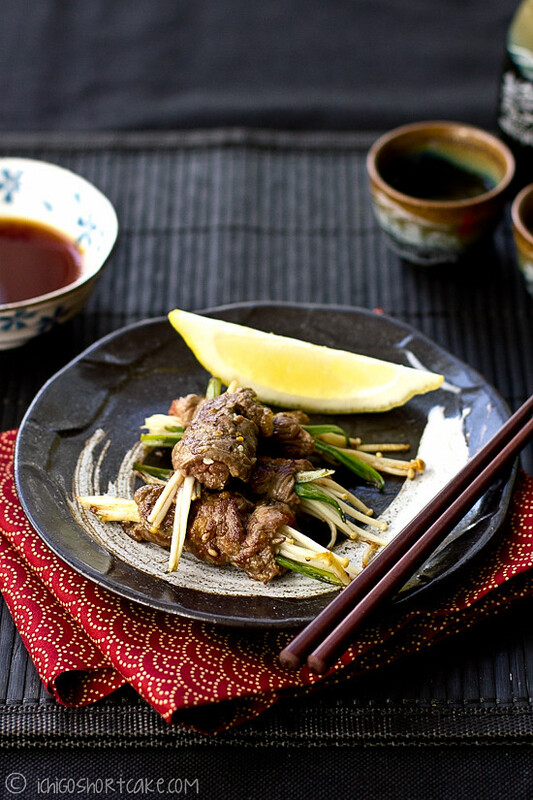 *** Ponzu sauce is a citrus sauce available at well stocked Asian grocery stores. If unobtainable, you can substitute it with light soy sauce mixed with lemon juice and a bit of mirin or sugar to balance out the flavours. Question time: Which country or type of cuisine is your favourite? I don’t have one single favourite cuisine but Japanese is definitely up there along with Vietnamese. And Italian. And French. And Chinese. Wah! that is my favourite, i love your presentation. how i wish to be your neighbour. How I adore Enoki! What a novel concept, I will be trying these soon!! This looks awesome Jenny – I love enoki mushrooms … they’re so cute and pretty and perfect for things like this too. Not sure if Japanese is my “absolutely favourite”, but it’s definitely up near the top of the list! I don’t think I have a favorite cuisine. If I’m homesick, it’s American. If I’m missing family it’s French. If I’m feeling chilly, it’s Italian. It’s okay to consider me weird. Love how you explained this dish. You photos are beautiful and easy to follow. Thanks! Nice, easy dish. I freeze my meat for 20 or so minutes too when I want to slice it thinly – it makes things much easier. That overhead picture of your ingredients arranged in the tray is wonderful. My fav cuisine? I’ll eat almost anything. Oddly, though, I almost never cook Japanese – I really need to do that more. anyway, very nice post – thanks. This dish looks almost better than the Japanese restaurant dish I had last night! This looks absolutely perfect! I wouldn’t mind one of those right now! Hi Jenny! Happy to hear you like Japanese cuisine, but I already know you like it from your posts and travel posts. 😀 You have been to Japan so you know what’s authentic (real) Japanese food. 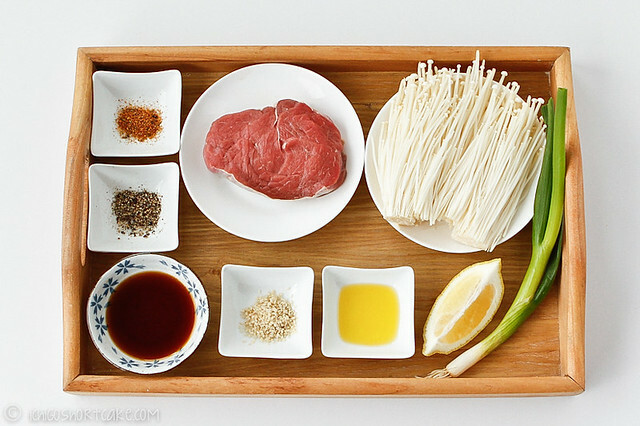 Here in the US, it’s almost impossible to find really good Japanese food that represents “Japanese” food… but I guess any cuisine can be like that in other countries… My favorite is Asian food in general and Italian food… Your Enoki beef rolls look delicious! I love how you setup ingredients and did step by step. Very artistic! Thanks Nami! Yes it’s quite obvious from my posts isn’t it. 😉 Even though there’s a lot of Japanese restaurants here, it’s also quite hard to find really authentic and delicious ones…it’s just not the same as when you’re in Japan, nearly every restaurant you walk into are authentic and quite nice…cheap too! I’d love to make this, but I’m not familiar with beef Scotch fillet. Do you know what the American name for this cut might be? Thank you for the clarification. I know and love rib eye so this must be oishii.